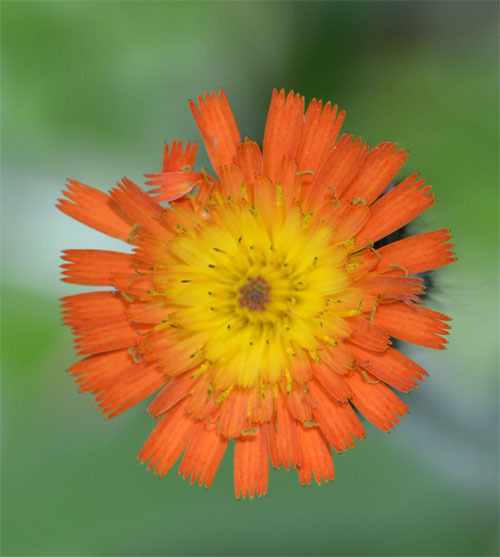 Orange hawkweed was first introduced from Europe into New England because of its attractive flame-colored flowers – it is a beautiful plant: Orange hawkweed has matted hairy leaves and handsome flowers, each about an inch in diameter and usually red on the margin, merging into an orange-colored center. The flowering branches, or shoots, grow from a few inches to two feet in height. They are leafless and covered with stiff black hairs. Problem is that once again our livestock is losing out – Hieracium aurantiacum is an aggressive competitor of pasture and range plant species, and it is unpalatable to our grazing cattle and horses.